The restaurant and juice bar at The Mandala is a tasteful combination of skilled chefs, local food, and a lot of love. The Mandala serves free complimentary breakfast to all its guests. The Mandala is primarily a bed and breakfast, but we also have a small and healthy menu for lunch and dinner with items that change every few days. For special occasions and festivities we often organise our lavish and luscious vegetarian buffet spread. We're conscious eaters and cooks, and we are a conscious restaurant that likes to avoid wastage of food when there are millions starving on our planet. For bookings please call us ! We also a have an incredible Juice Bar with all kinds of concoctions, juices and smoothies, including shots of wheatgrass, turmeric, bittergourd, and ginger to give you the boost you need to enhance your perceptions of life, the universe and everything! Teas, herbals, coffee and beverages are also available. We also have a bar. 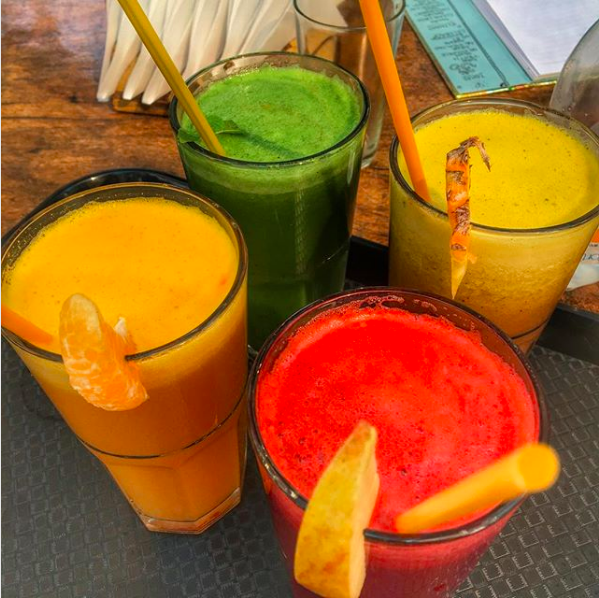 If you are interested in taking full advantage of all that The Mandala's Juicing Talents we highly recommend one of our juice detox programs during your time here. All of us at The Mandala are juiceaholics. We are well read and experienced in the Art of Juicing. We have an extensive juice menu, designed from local and seasonal fruits and vegetables, creating unusual and compatible blends suitable for your ayurvedic dosha. Also offered are healthy shots and potions from turmeric, ginger, wheatgrass as well as supplements such as ginseng, spirulina, bramhi and aswagnadha. 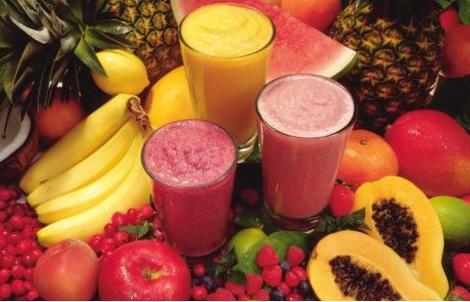 The juice bar is open all day and we also offer juice fasts for a complete cleanse of the body and mind. A delicious and healthy breakfast buffet is complimentary with your room for all guests. Breakfast is served from 830 to 11 AM. Our breakfast is wonderful and healthy , with a buffet of herbals and teas, Homemade muesli (seeds, nuts, oats, popped lotus seeds etc. ), Organic Brown Rice coconut porridge, Fresh cut organic local fruit salad, Locally made brown bread , Fresh Homemade Curd , Tomatoes, Cucumbers, Herbs, Homemade Mandala Papaya Cinnamon Jam, Hot herbal tea, Local instant coffee ( we also have local organic Blue Tokai coffee from Kerala that you can order at an extra price)., Ginger lemon infusions cold, Eggs (any way you like it), Organic butter. We have a small lunch and dinner menu that changes every few days. We are what eat, and therefore we aim for a simple, clean, healthy menu created from locally sourced ingredients, as our offering to you for your training. Let Food be thy Medicine is our kitchen’s motto, and so everything is prepare fresh to nourish your mind, body and soul. Our food is simple, organic and delicious made completely from local ingredients supporting local farmers. We also have vegan replacements such as coconut milk and soya milk at a minimal extra charge. When you book a dinner buffet as a retreat or TTC organiser, you will get a smorgasbord of vegetarian and vegan dishes with fresh, seasonal, local produce being the keywords. The healthy and creative delicacies has been carefully compiled by the owner who has extensive culinary travel experience and seeks to combine flavours from around the world whilst maintaining a home cooked unpretentious approach. He has extensive experience cooking the largest compilation of vegan dishes that you will find here in North Goa. The Mandala has now built up a reputation of mouthwateringly delicious, and very healthy spreads for our Yoga retreats, which are a feast for all our senses. 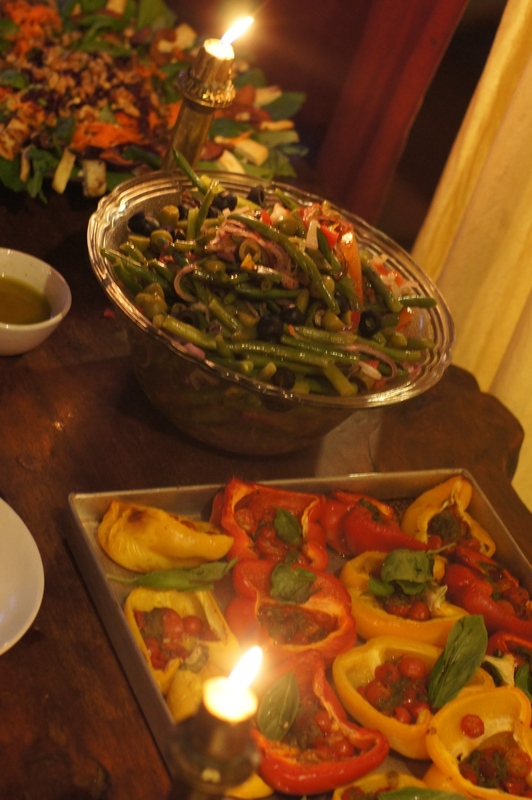 If you are a retreat organiser and wish to have your guests go absolutely gaga on good food, choose the Mandala.